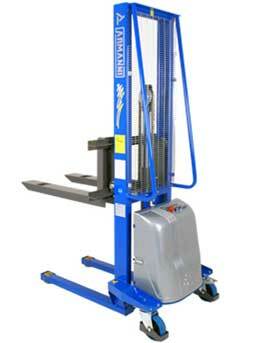 The Alfa 12v Semi Electric Stacker has the perfect combination between a fully electric stacker and a manual stacker. Due to its manual push and pull and its electric raise and lower. It can reach heights of up to 3500mm with ease, making it versatile for a variety of applications. Manually adjustable forks makes it is possible to work with the stacker moving loads of different dimensions and it’s versatile enough to adapt to the operator’s requirements. The Alfa Semi Electric Stacker’s shockproof casing, made of sheet steel and ABS contains all the primary components, control unit, battery, battery charger, etc. Making it stable, safe and secure for the operator to use. The current regulations in terms of safety at the workplace impose very strict limits on the manual movement of loads by the operator; therefore, the ALFA 12v semi electric stacker represents the right and economical solution in order to move medium-light loads in compliance with the current regulations.